The Antarctic (based on Ponting photograph). 047. 7. THE ANTARCTIC. Issued to members of Trex Club by J. Bibby & Sons Ltd. (1955). Card number 7 from a set of 25 entitled "This Wonderful World". 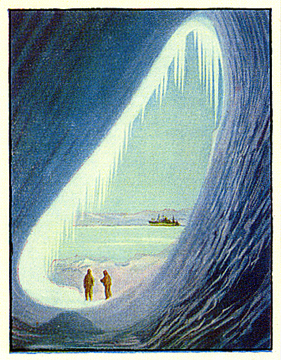 Recto: View from within ice grotto with two men near entrance and ship in distance.